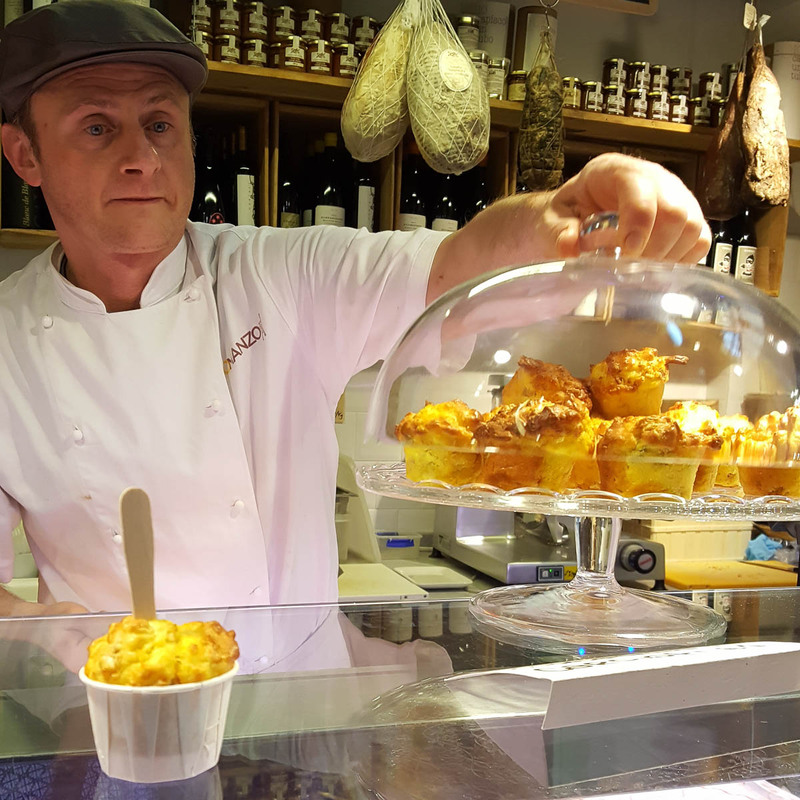 Visiting Italy and not spending at least an hour or two at one of its many markets is like seeing the country but failing to grasp what makes it tick. 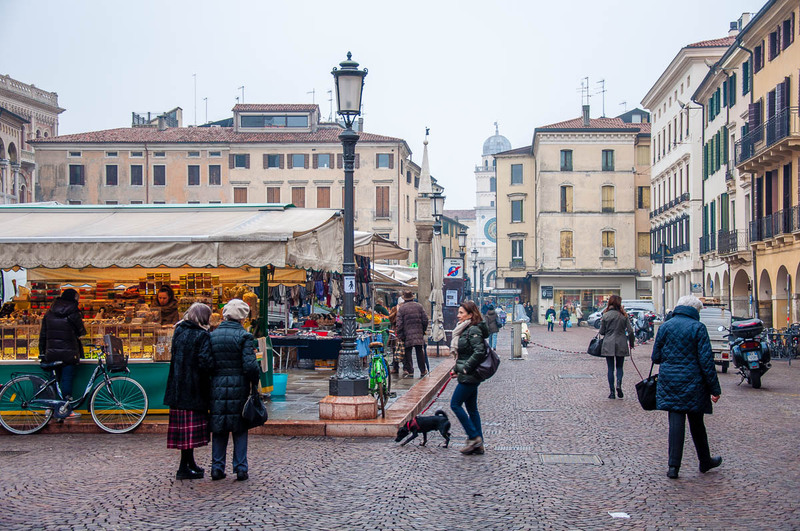 Markets – big and small, weekly and daily, for food, antiques and/or clothes – are both an Italian institution and tradition that have been fostered and mastered for centuries. 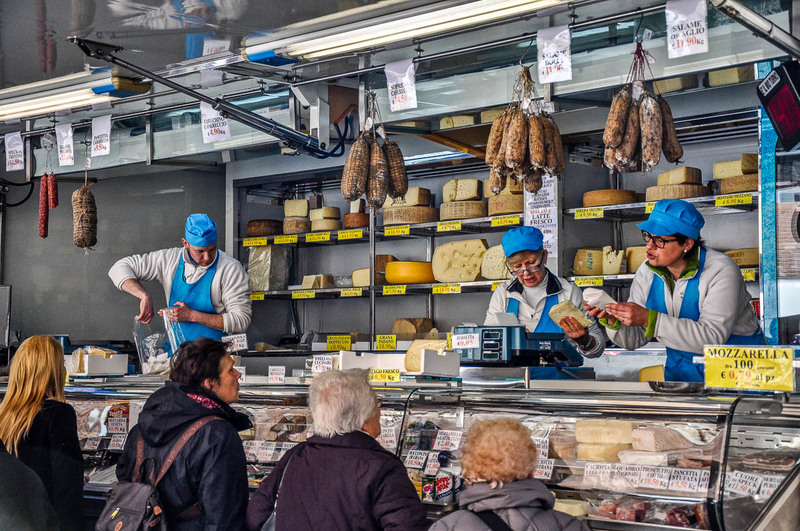 Italian markets are lively places where you can see a cross-section of Italian society and learn more about the local customs and etiquette than spending days on end leafing through anthropology books and exploring museum exhibits. 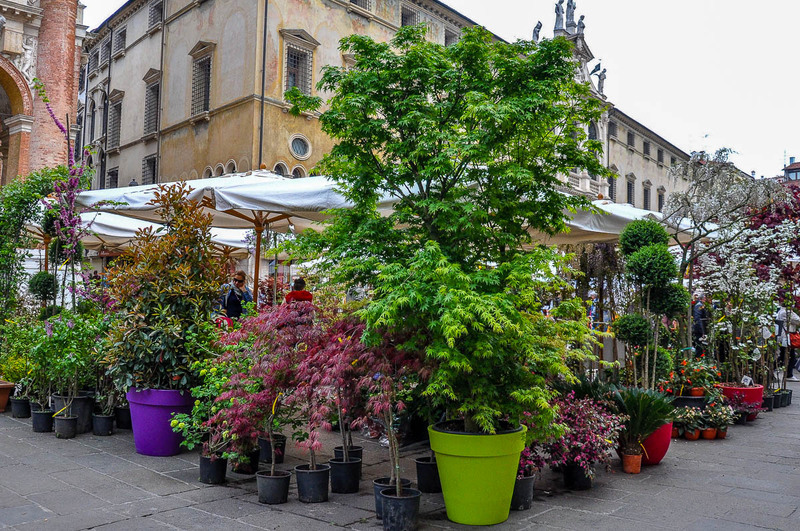 Plus, there is nothing better than picking fresh seasonal fruit and veg from an Italian market that has placed its stalls and marquees on a historical piazza surrounded by world-famous buildings. 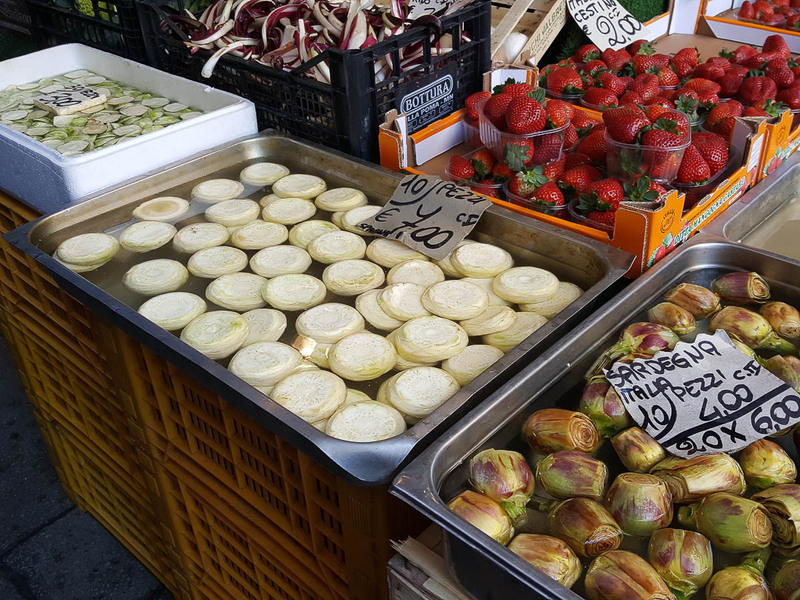 Before we start in earnest with the different types of markets you can find in Italy, let me give you a quick introduction to Italian markets and how they operate. Every village, town and city in Italy has its own market. Depending on what the market sells and how big the village, town or city is, the market could be held daily, weekly, once or month or even once a year. 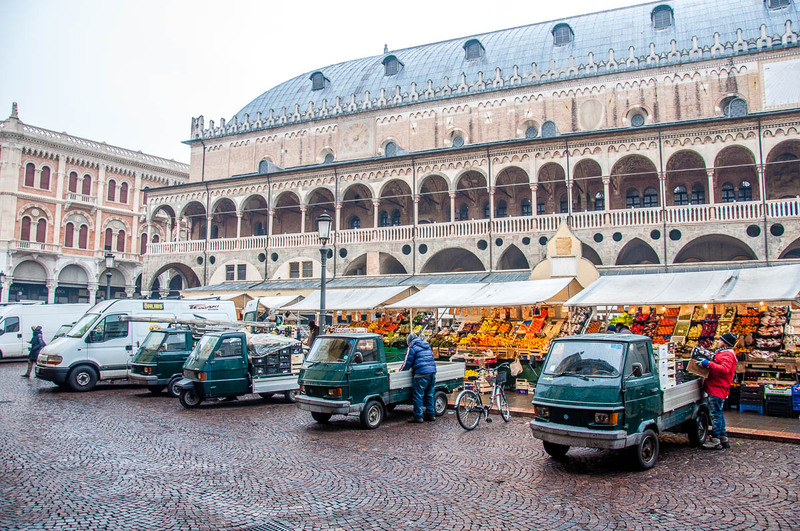 For example, Padua being a larger city with lots of history attached to it has a six days a week fresh produce, clothes and household items’ market that has been held at the same three adjacent squares for eight centuries. 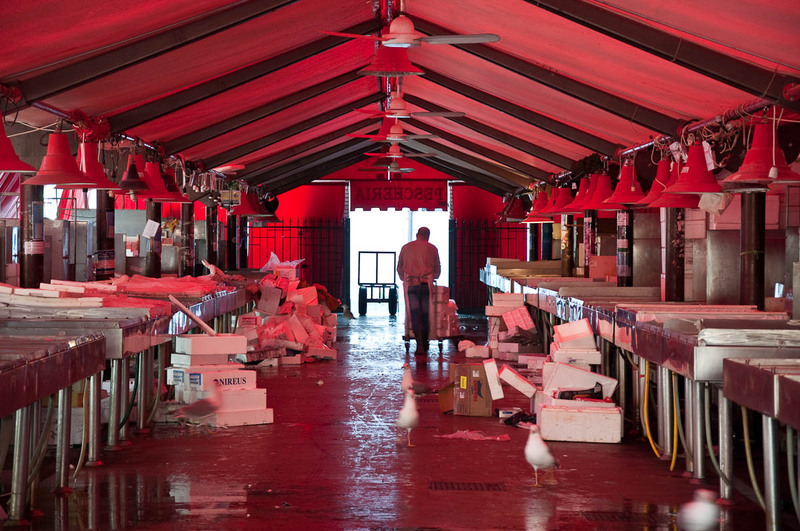 Venice has its 1000 years old Rialto Fish Market which is open from Tuesday to Saturday. 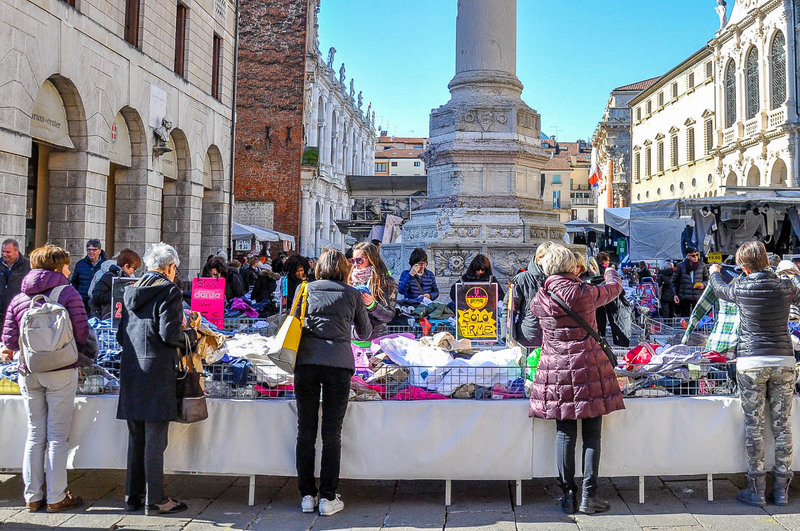 Vicenza – a smaller Northern Italian city – has a twice a week market which takes over the historical centre and where you can buy anything and everything from a new scarf and pants to curtains, beads and potted plants. 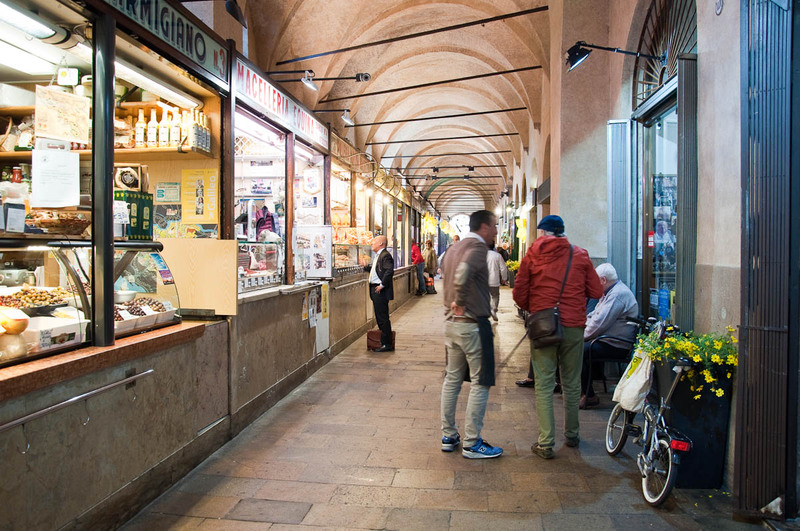 This type of market in Italy sells predominantly fresh produce and food, clothes and bags, as well as household items. The trading day starts early in the morning and by the early afternoon, the shutters are coming down. So, if you want a kilo of juicy grapes or an etto (Italian measure which is equal to 100 gr) of freshly caught crabs, you better make it to the market soon. Come 1 pm and the stalls are already being cleaned and then dismantled to free up space for the surrounding bars and cafes to lay out their tables and chairs alfresco if the weather is good. Often, instead of actual stalls made of metal pipes and wooden planks, you will see big vans that have been customised to operate like a travelling shop. They have a tidy shop front with refrigerated display cabinets for the perishable foods and a large awning to shelter the clients from the strong Italian sun. At the end of the market day, it is quite a wondrous thing to see how a market seller tidies up his or her van, folds the awning into a special compartment on top, shuts the doors and, once again, it becomes a vehicle able to transport the seller and his stock. Many of these vans spend each day at a different weekly market in the small towns and villages of a given Italian province or region. 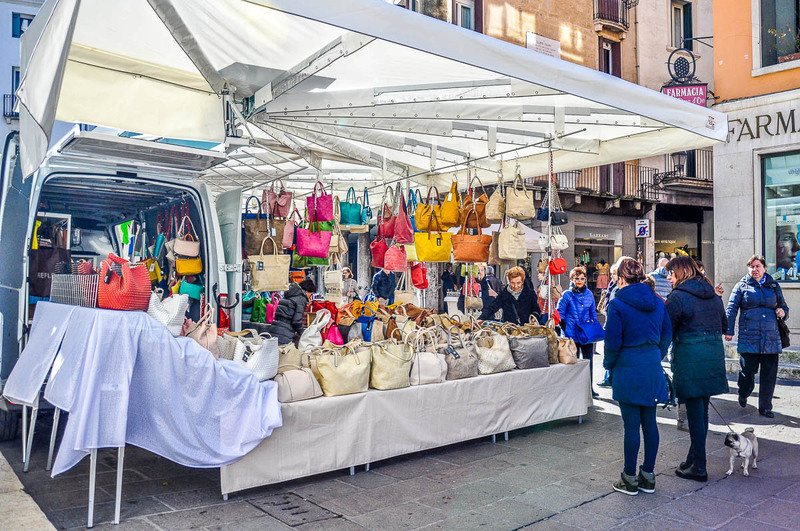 In addition to the daily and weekly markets that sell mainly fresh produce, clothes and household items, there are also many specialised markets in Italy which are held less often but attract a lot of interest. Starting with the chocolate markets (yes, really!) 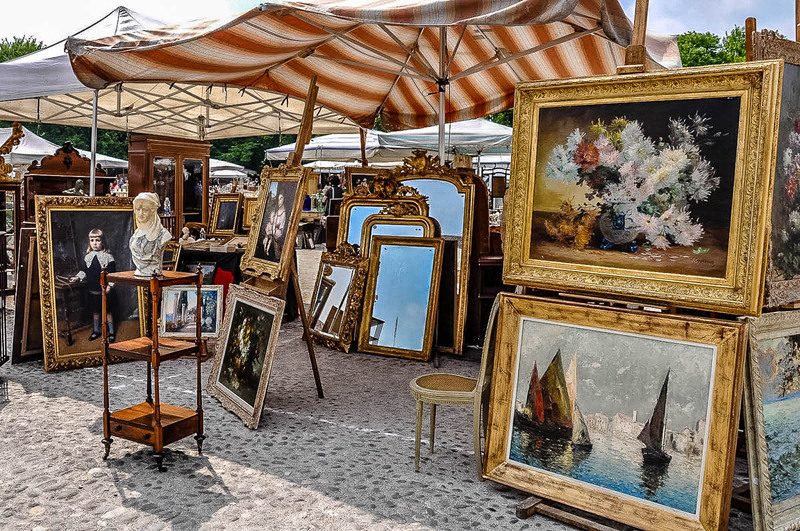 which happen once a year in towns and cities up and down the length and width of Italy and finishing with the monthly antiques and vintage markets, there is a wide scope of Italian markets dedicated to a particular hobby or interest. Once again, these specialised markets are held at historical squares and spilling down the adjacent streets. As they take place less often, they are more like an event or a fair, if you like. The stalls remain open all through the day and, sometimes, into the early evening as well. Plus, a rich programme of events may accompany them, too. Where to Find Information About Markets in Italy? Your best bet is to ask at your accommodation and at the local tourist office. The people working there should be able to tell you when the food, clothes and household items’ markets are held during the week. 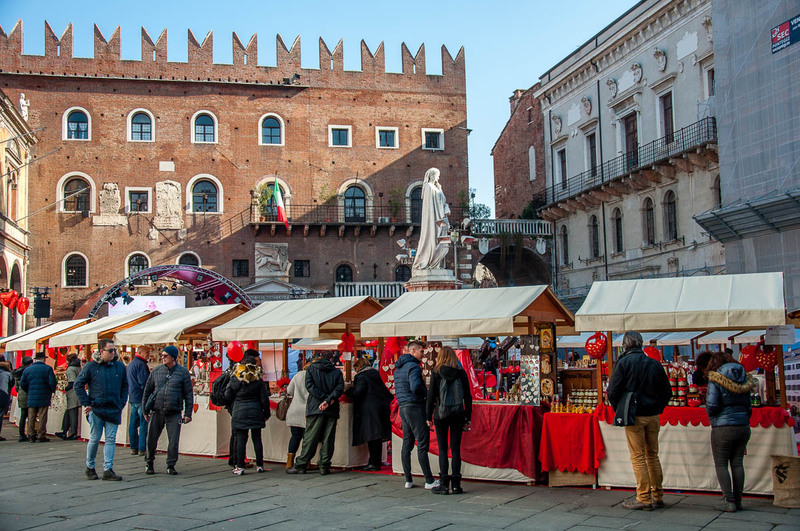 They should also have lots of marketing materials for any specialised markets like a chocolate fair or a medieval market that are to be held around the time of your visit to Italy. 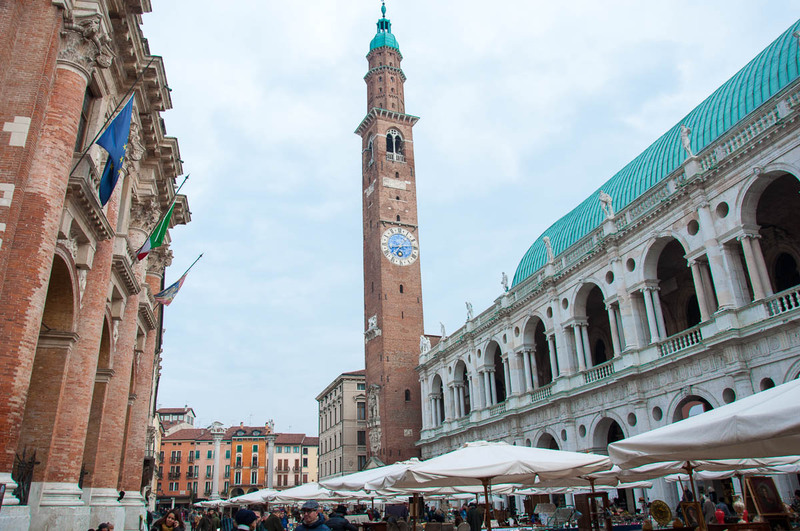 You can also use the tourist information website that each Italian town, city, province and region has with information about local sights and places of interest. For example, you can search for ‘market’ on the Bologna Welcome site and get all these results. For information about Christmas markets, try either this or this site. 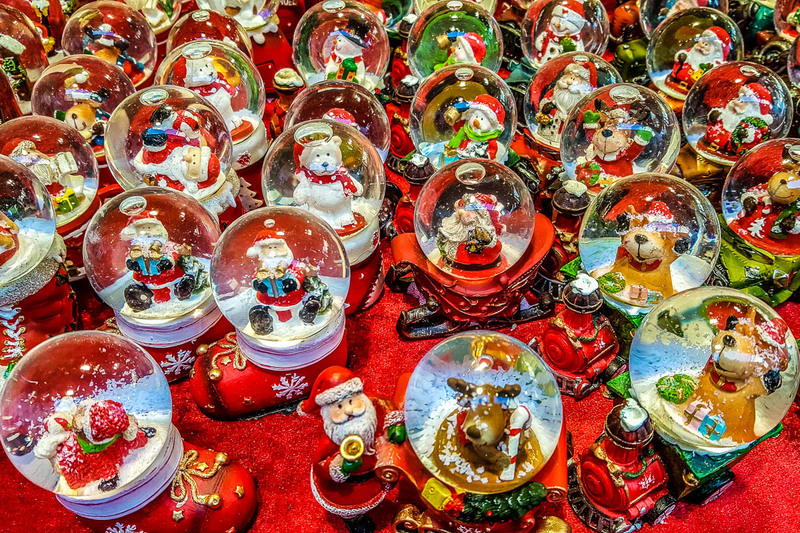 They are both in Italian but with a little help from Google Translate, you can find lots of details about forthcoming Christmas markets all over Italy. Or you can use my Christmas Guide 2018 for Northern Italy to get a huge list with Christmas markets and other events to be held in the northern part of the country. 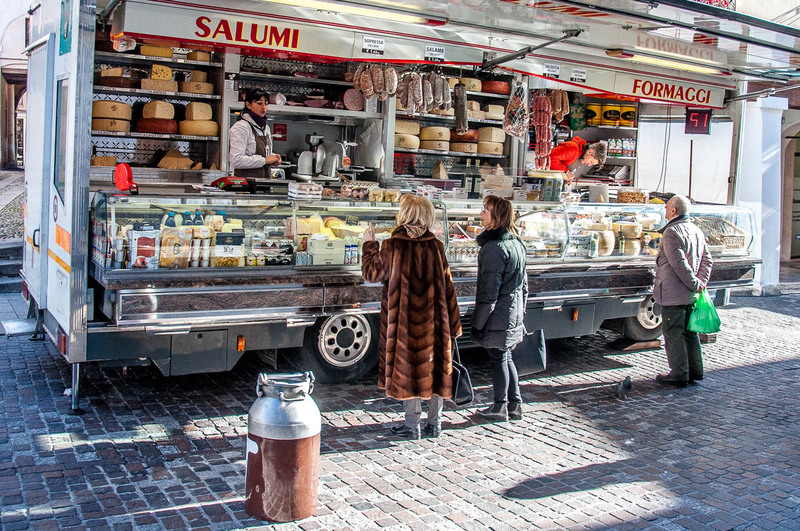 Should You Visit a Market in Italy? 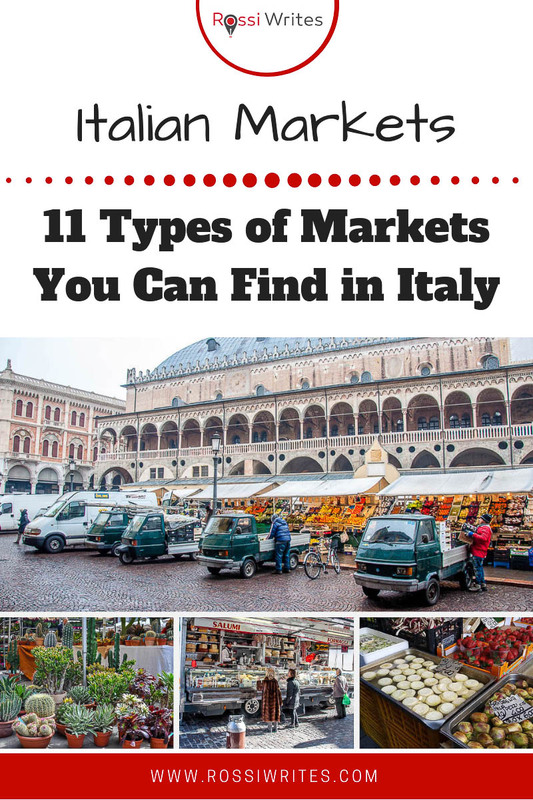 Based on my four years of living in Italy and exploring every Italian market I have been lucky enough to come upon, here is a nice and tidy alphabetical list of the types of Italian markets you can see for yourself here. I encourage you to not miss a chance to shop at an Italian market or at least to stop for a moment in the middle of one to experience its unique atmosphere and to absorb the hubbub that would be going on all around you. It would be the quickest and most immediate cultural immersion you can wish for as well as an easy way to get out of your comfort zone when exploring and savouring everything that Italy has in store for you. 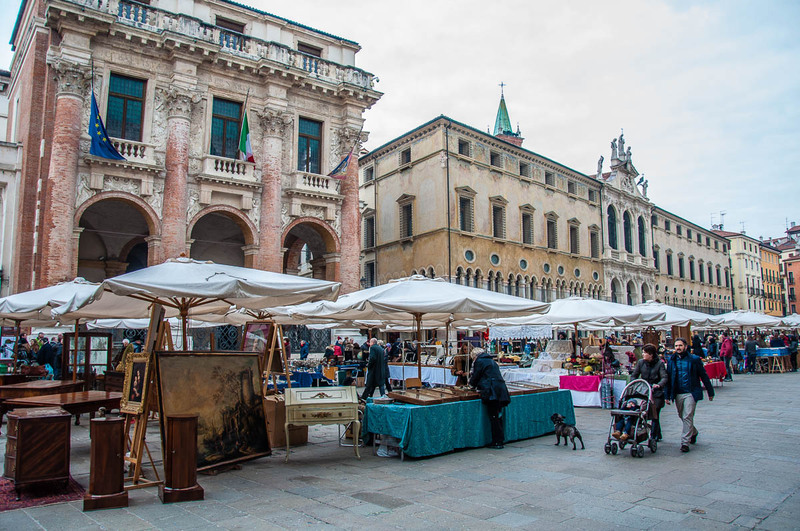 I have included lots of photos, too in order to give you a good visual idea of Italian markets and the great contrast between the items sold at them and the surrounding architecture which is easily several centuries old. 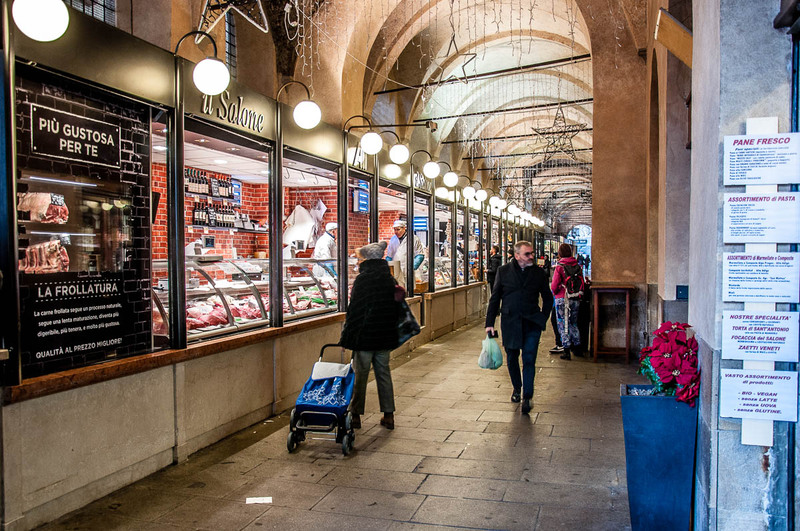 Even though an Italian market is not a clear-cut piece of tangible Italian heritage like a historic church or palace, for example, intangibly it gives you a great idea of the country, what it stands for and how trading is one of its most prevailing roots. 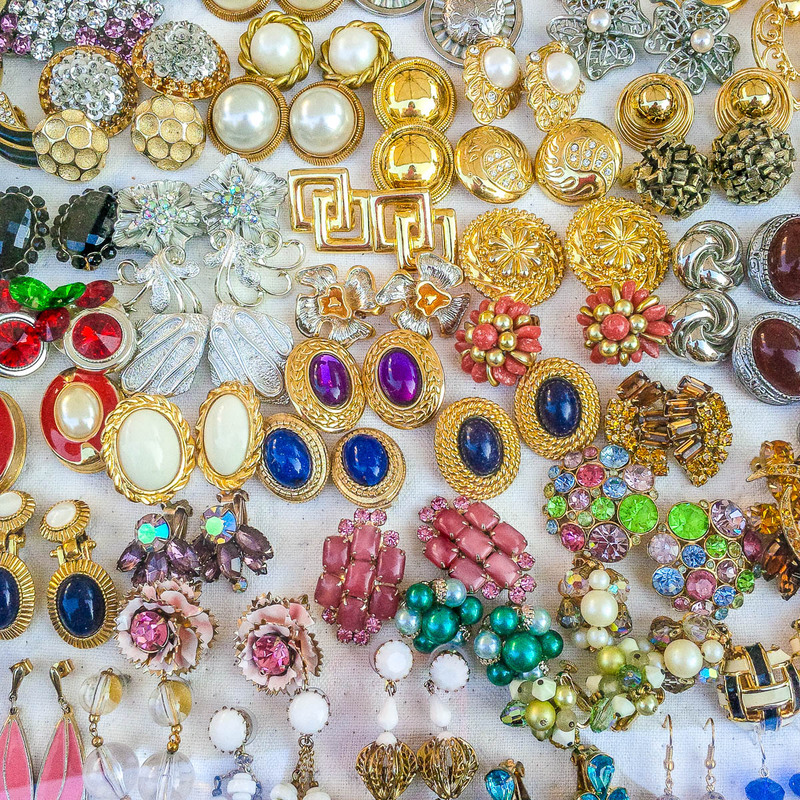 Antiques and vintage markets are very popular in Italy and are regularly held once a month in towns and cities all over the country. You can find anything and everything at them. From collections of vintage and porcelain dolls to old-fashioned typewriters, from paintings that are a couple of centuries old to antique Murano glass chandeliers. If you love antiquing or just like looking at beautiful things with lots of history, you will be in heaven. 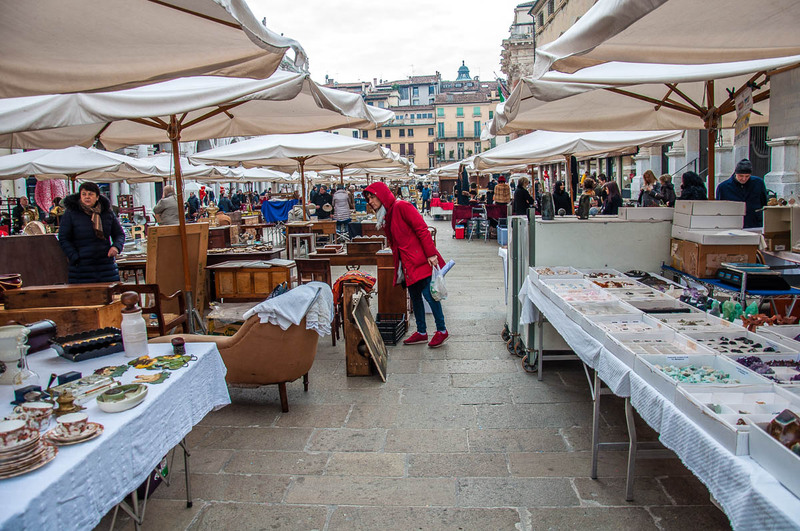 In Vicenza, don’t miss the monthly antiques and vintage market called Non ho l’eta’. 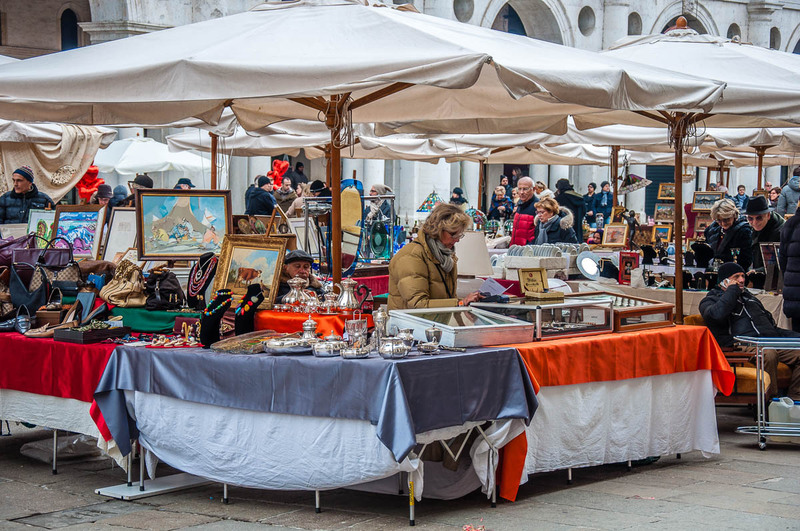 If you want to spend a whole day antiquing, then head to Piazzola sul Brenta where on the last Sunday of every month you will encounter one of the largest antiques and vintage markets in the whole of Italy. Crafts like pottery- and jewellery-making, woodturning, metalworking, paper marbling, glass blowing and leatherworking have been elevated to almost an art in Italy. Everywhere you go you are bound to come across dozens if not hundreds of shops where master craftsmen have been working for generations creating beauty with their skilled hands. A great way to meet many different craftsmen and to see and purchase the fruits of their hard work is to visit an arts and crafts market. There, you can talk face to face with the people behind the beautiful objects you will be craving to buy. You can also see live demonstrations and pick unique items to give as gifts or keep for yourself. 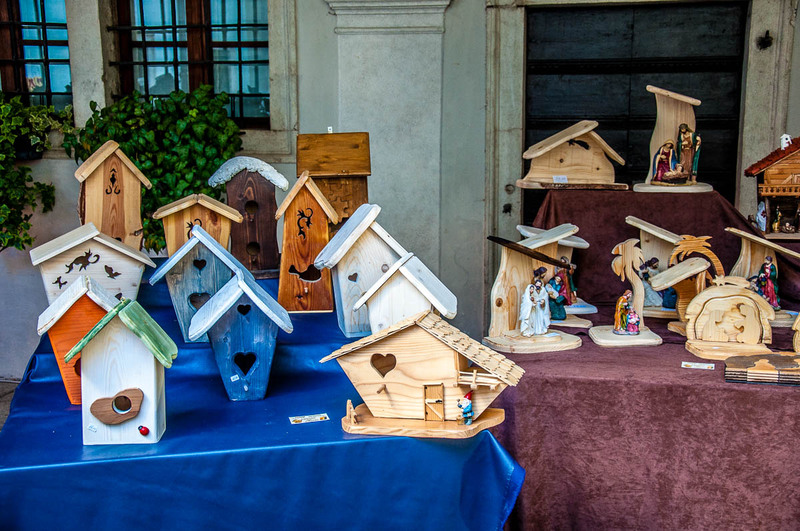 In the past three months or so, I have been lucky to see three arts and crafts markets in Italy. One was held in the garden of a historical villa in Caldogno – a small town just outside of Vicenza. 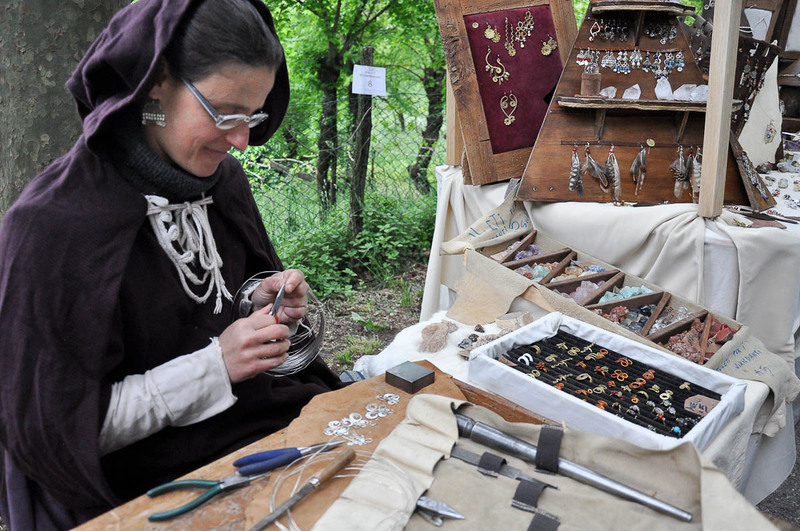 Another was a large art and craft market called Artigianato Vivo which was held over several days in Cison di Valmarino – recognised as one of Italy’s most beautiful villages. And the third was a large pottery market in Nove – a small town famous for its world-class ceramics. 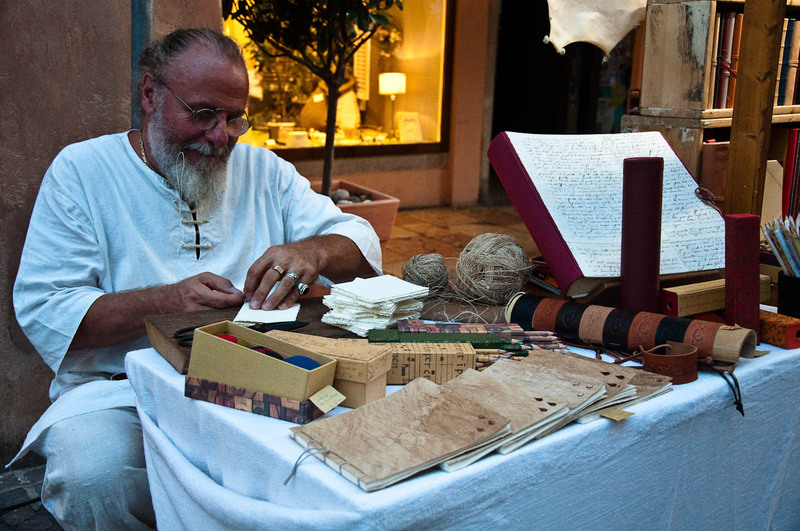 Arts and crafts markets are regularly held all over Italy. For example, I took the photos above at arts and crafts markets in Verona, Ala and Ferrara. 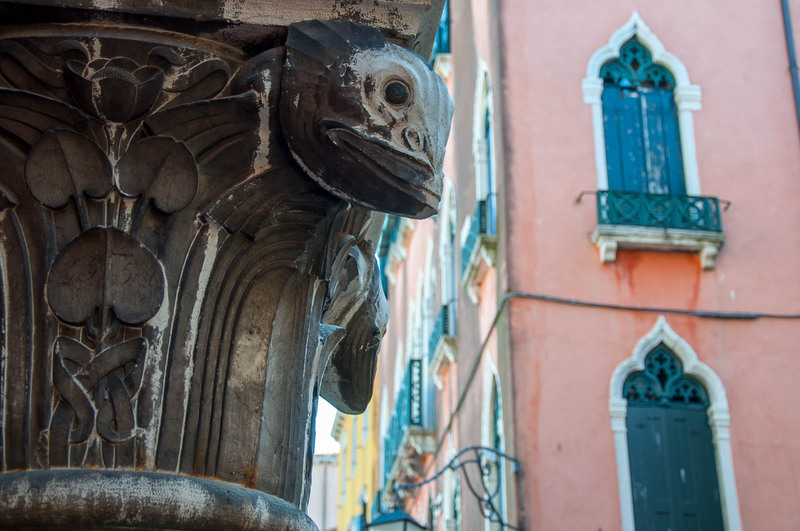 Make sure that you ask at your hotel and the local tourist office or check online to see if there will be one at the place and at the time you will be visiting Italy. Markets in Italy are not held just in historic squares. Several Italian cities and towns have specially built covered markets where trade has been going on strong for centuries. 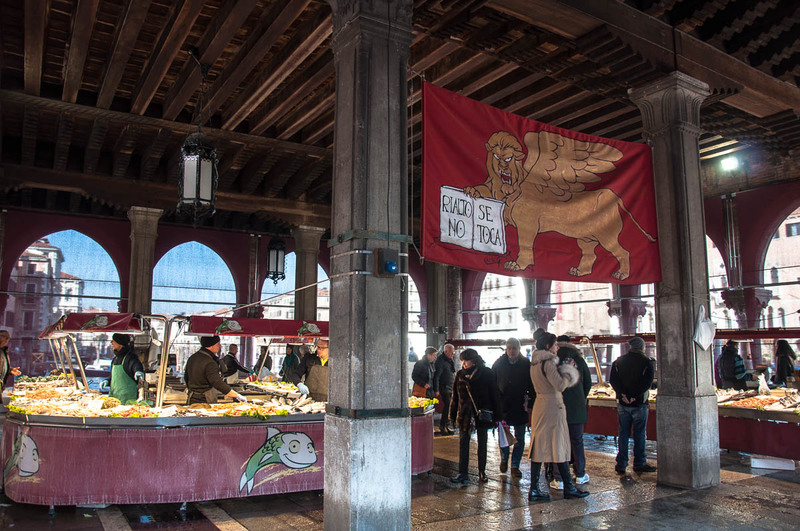 If you find yourself in Venice, Bologna, Florence or Genoa, make sure that you visit Rialto Fish Market (Venice), Mercato delle Erbe and Mercato di Mezzo (both in Bologna), Mercato Centrale (Florence), and Mercato Orientale (Genoa). There you will be able to buy fresh food and produce to cook at your digs. Or you can simply lunch and dine like a king on authentic local food prepared and served by the traditional delis and eateries huddled inside the covered market. 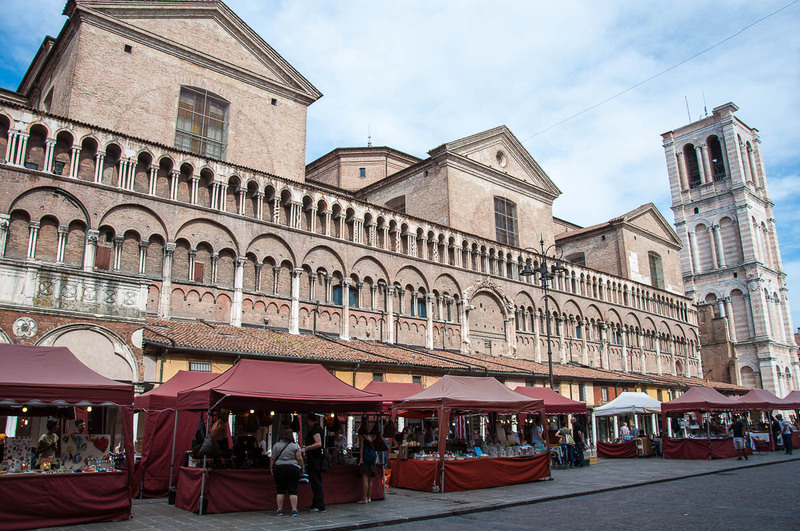 If you find yourself in Padua, don’t miss Sotto Il Salone – arguably the oldest shopping centre in Italy. This is the arcaded area on the ground floor of the splendid Palazzo della Ragione which has been housing Padua’s finest delis, cafes and food shops for the past 800 years. In other words, this is one of the best covered markets you will have a chance to see in Italy. Don’t miss it! You may not expect it at first, but Italy has some of the loveliest, most festive Christmas markets this side of Europe. 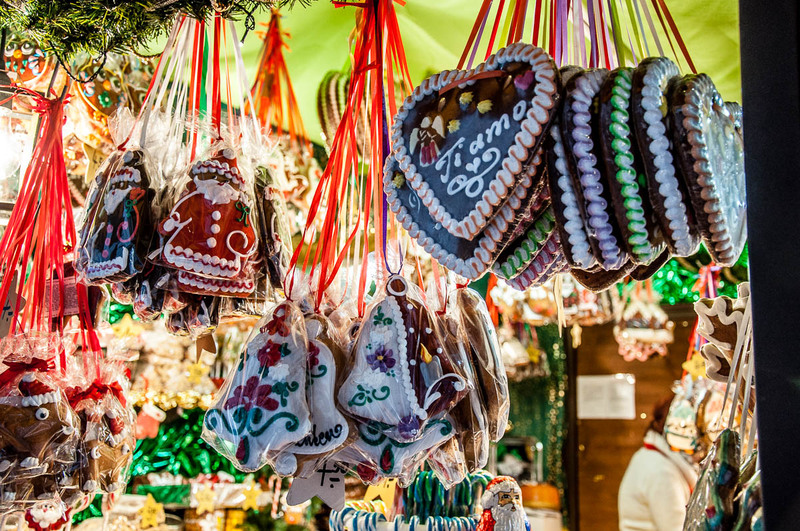 Bolzano, Merano and Verona are all competing to attract the largest crowds with their Christmas markets hosting dozens of stalls selling a nice selection of handmade Christmas decorations, gifts and sweets. Yet, no matter where you choose to go – Rome, Turin, Milan or a small medieval village in the Dolomites – you can expect a splendid Christmas market that is a lot of fun to browse and shop at. Christmas markets are held in Italy traditionally from the end of November to Epiphany on 6th January. That’s like a month and a half of Christmas cheer and vin brule’ (that’s mulled wine for you and me). Depending on the place, the Christmas markets can be open every day or just on selected weekends. It could be quite the shock to the system the first time that you see a historical Italian square that you have spent years dreaming to visit only to find it occupied by huge market stalls selling the most mundane of items like pants and pots. In fact, I remember travelling together with my then boyfriend (now husband) to dreamy San Gimignano. I had already been to this Tuscan hill-top town which is widely known as the Medieval Manhattan. So, I couldn’t wait to experience its beauty again with my significant other. I was totally upset when, upon arrival, we discovered that our visit had coincided with the weekly market. Hence San Gimignano’s medieval piazza was taken over by a series of market vans selling such unromantic stuff like leggings and baking trays. My boyfriend took it in its stride though and said that he loved the opportunity to see a slice of real Italy rather than the manicured image we are so often presented with on TV and online. I came to agree with him rather quickly while snacking on a generous piece of cheese and some local finocchiona (thick Tuscan salami with fennel seeds) which we bought from a smiling market trader. 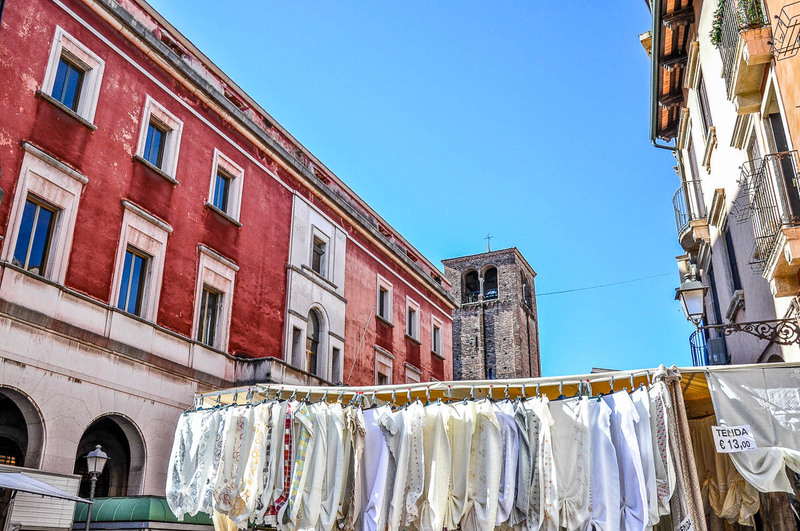 So, yes, spend a bit of time in Italy and you are bound to come across one of these clothes and household items’ markets which once or twice a week take over a pretty historical square. Clothes and household items’ markets are often combined with food and fresh produce markets. For added variety, there could be a fish stall or a fish van, too. Plus some stalls selling flowers and potted plants. 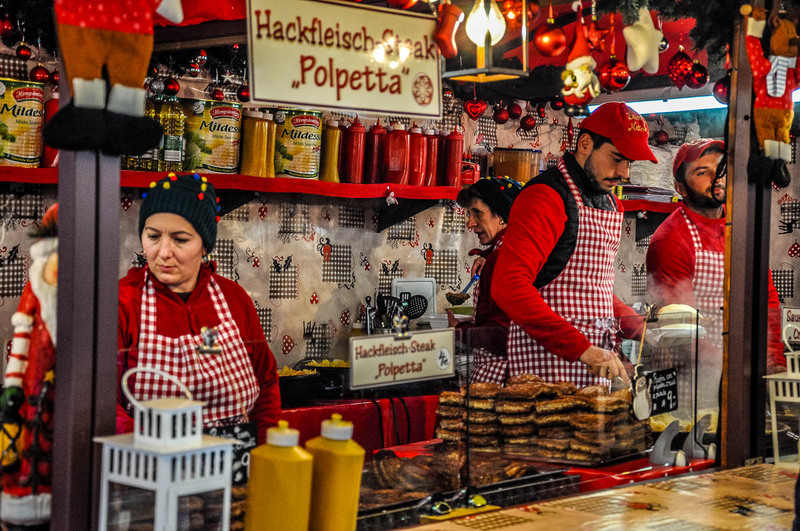 It’s a good mix, really and, before you know it, you may end up buying that grater you totally don’t need, a Christmas tablecloth or a whole sausage of the Venetian salami sopressa even though you may not have a fridge in your hotel. 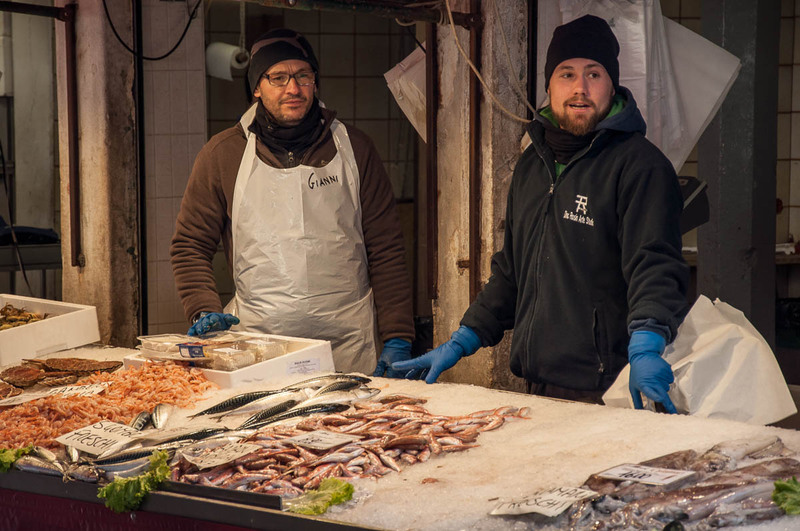 If you like fresh fish and seafood, you will be quite delighted to find out that Italy has some of the most amazing fish markets you can wish for. Dozens of varieties of freshly caught fish and shellfish will dazzle you and leave you spoilt for choice. 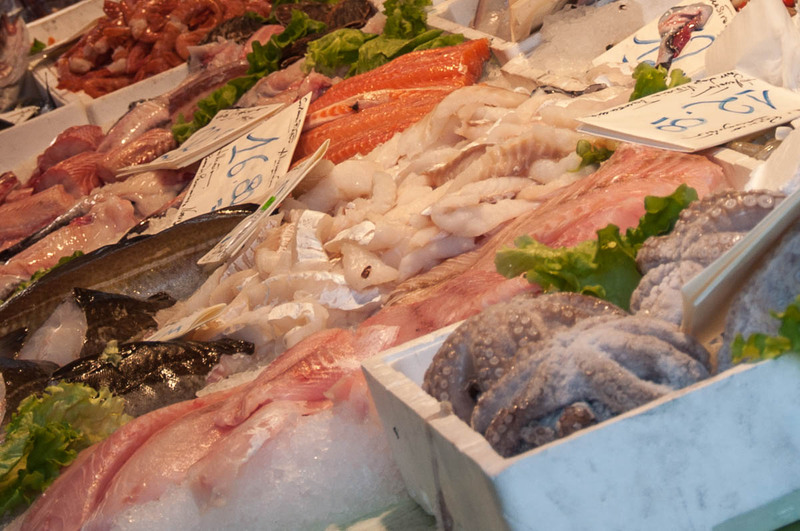 You will even be able to buy several types of seafood which are typical just for a particular region of Italy. Like the moeche soft-shell crabs in Venice – a delicacy which, truth be told, costs an arm and leg but can be sampled only there. 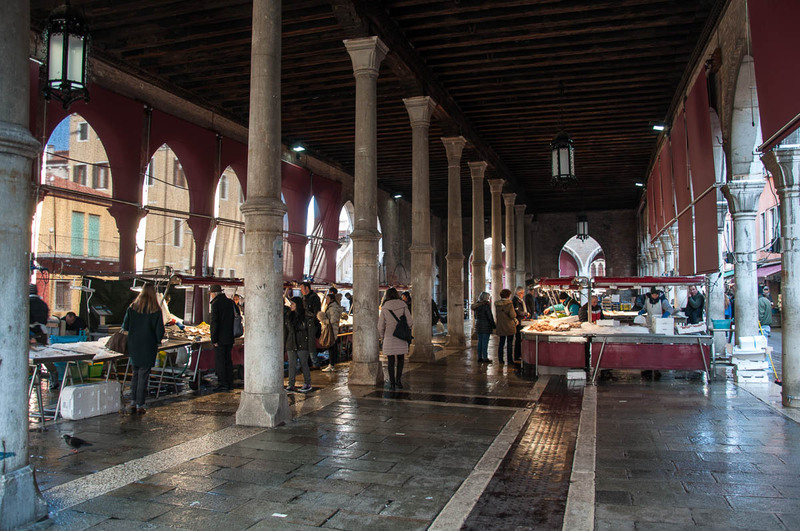 I have had the chance to see three fish markets in Italy – the Rialto Fish Market in Venice as well as the Mercato Itico (the wholesale fish market) and La Pescheria (the retail fish market) in Chioggia. Make sure that you visit more Italian fish markets than me! 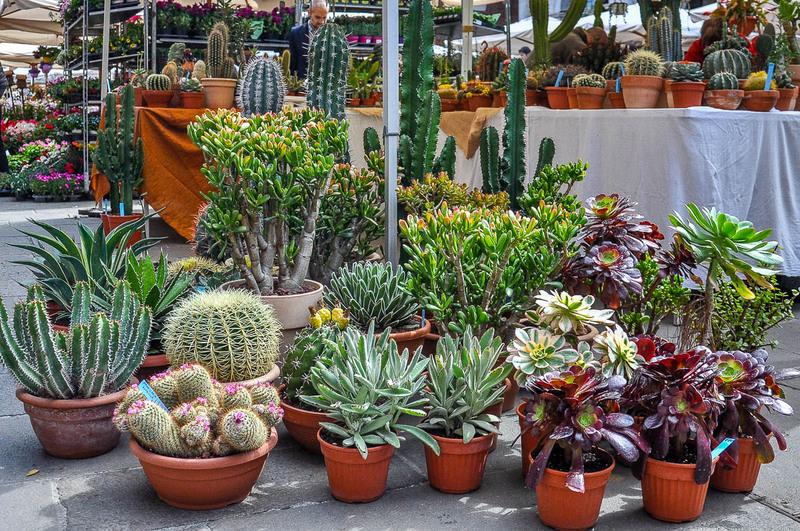 Imagine a huge market selling nothing but flowers and potted plants – from the tiniest cacti to huge flowering bushes and whole trees! 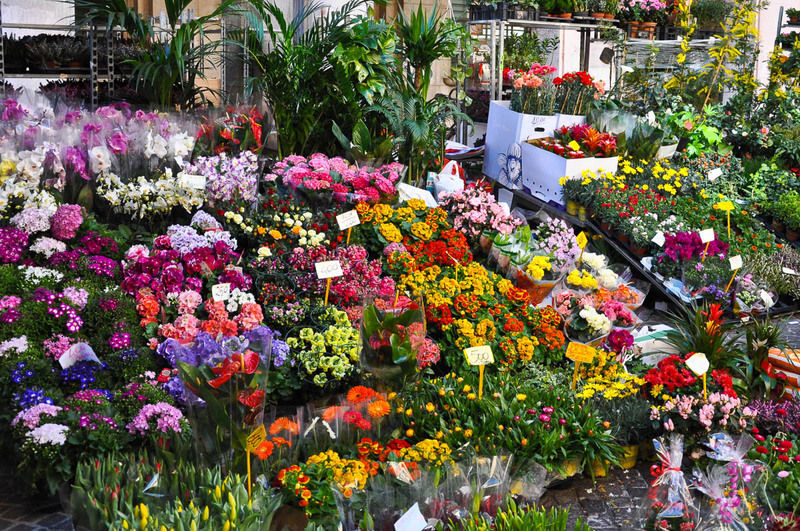 Then you will have an idea of what a floricultural market in Italy looks like. 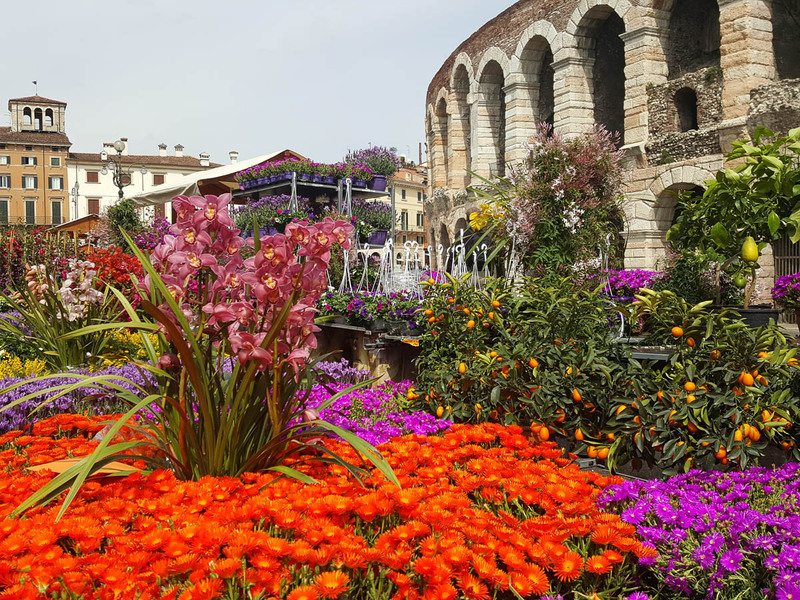 There are many nurseries all over the country and each spring they get to exhibit their flowers and plants in the historic centres of many Italian towns and cities. These are some of the greatest markets I have had the chance to visit here in Italy. They are so beautiful! And, if you love flowers and potted plants, you will be sorely tempted to spend all your money on bulbs and shrubs. Speaking from, ahem, experience! 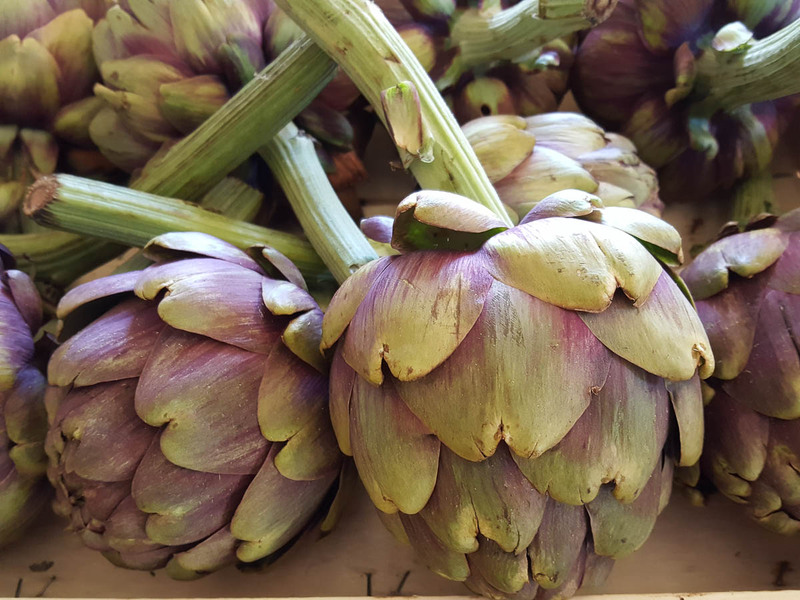 Nothing tastes better than seasonal, locally-grown fruit and veg bought fresh from a market in Italy. Citrus fruit from Sicily, strawberries from Matera, kiwis from around Lake Garda, peaches from Verona, red radicchio from Treviso, white asparagus from Bassano del Grappa, broccolo fiolaro from Creazzo, peas from Lumignano, lemons from the Amalfi coast, cherries from Castegnero… The list can get immensely long. Every place in Italy is famous for a local fruit and/or veg which grows particularly well there due to favourable climate and cultivation techniques honed over centuries. Honestly, once you have had a Zero Km fruit or veg, you start packing (at least mentally) your stuff and wanting to move to Italy. 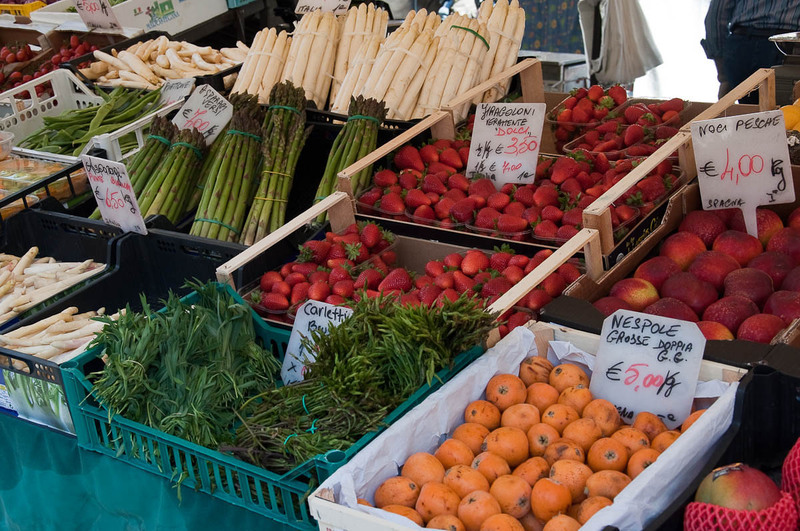 The best place to buy fresh fruits and vegetables in Italy would be the local market. Ask at your hotel and the local tourist information office when it is held and head there early in the morning for the best picks. 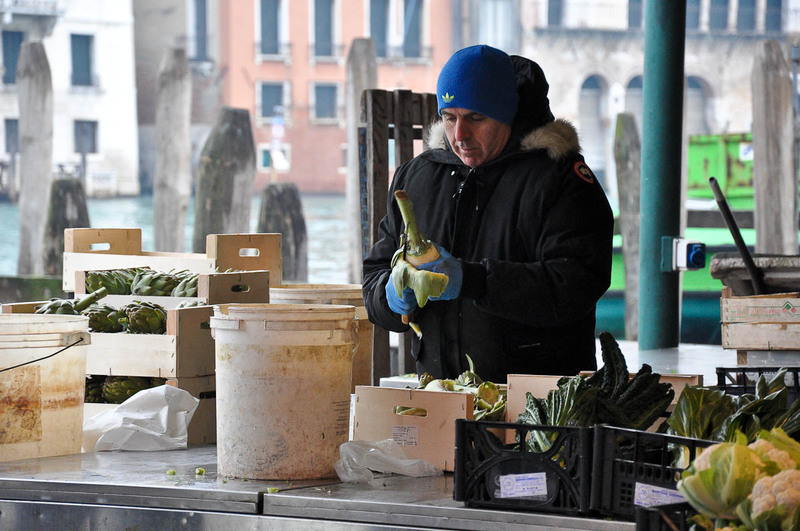 Markets have been vital to life in Italy for centuries. If you really want to feel the spirit of this young in terms of a united history country, head to one of the marketplaces in it that precede Italy’s formation by hundreds of years. 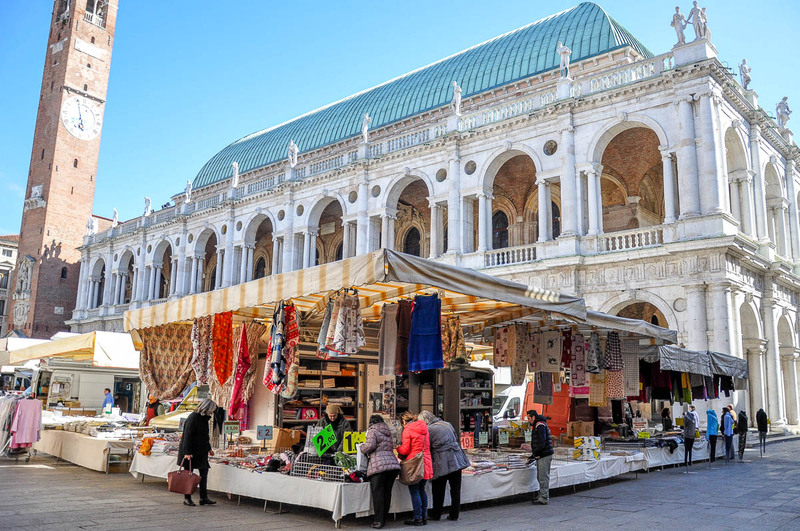 Such as the above mentioned Rialto Fish Market in Venice, Mercato di Mezzo in Bologna, Mercato Orientale in Genoa and Padua’s 800 years old market that is housed underneath and around the city’s Palazzo della Ragione. Add to this list Porta Nolana in Naples, Mercato del Porcellino in Florence, and Campo de Fiori in Rome. Look even deeper and you are bound to unearth dozens of other markets in Italy that have been going strong for more decades than we can count on both hands. 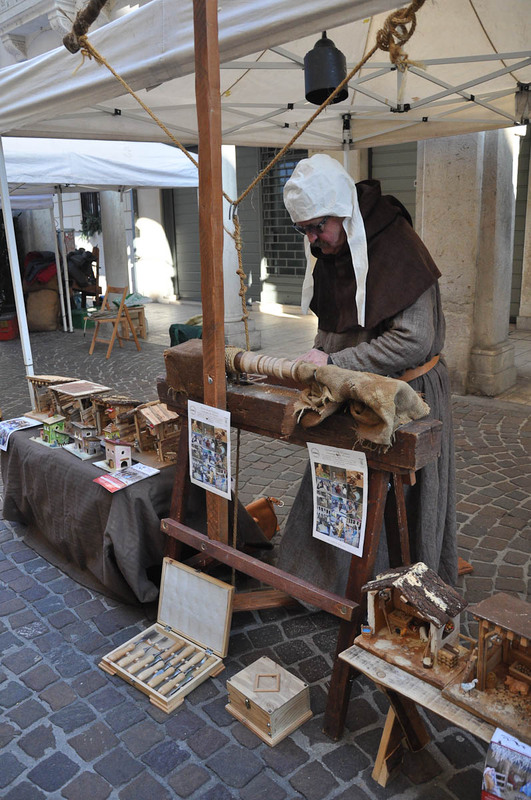 Unlike the historical markets above, the medieval markets in Italy have not been going on for centuries. Instead, they are a rather new construct yet they recreate the look and feel of the Middle Ages. You will find them attached to large historical reenactments held in medieval towns and around medieval castles all over Italy. People dress up in medieval garb and set up stalls selling anything and everything that represents the spirit of the Middle Ages. Jewellery, pottery, swords, shields, shoes, clothes, arrows and bows, textiles, handbound books. 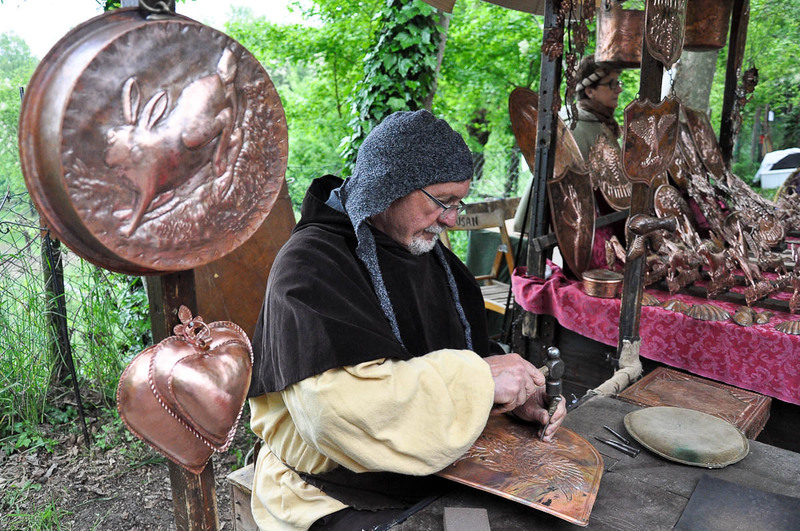 You can find all sorts of weird and wonderful things at these medieval markets. The items sold are mostly handmade by the market traders themselves who are only too happy to chat and explain the intricacies of their craft and how it was practised in medieval times. Ask at your hotel or in the local tourist information centre if there will be any historical reenactments held during your stay in Italy. You are bound to find a nice medieval market taking place alongside such events. 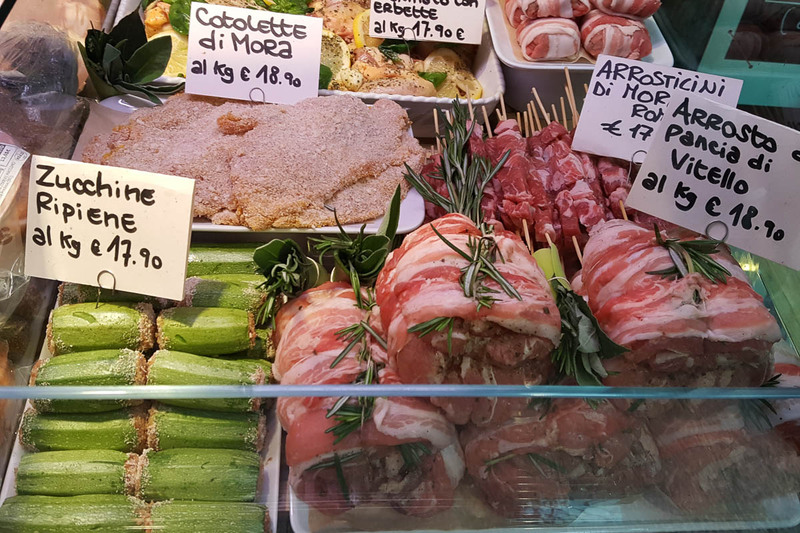 Among all the other types of markets in Italy, the specialised food markets you can find here are certainly my favourite ones. For ease of explaining what they are, I call them specialised food markets, but this is just a term I came up with so don’t expect to find it anywhere else. These are markets which are dedicated to one foodstuff and all of its varieties. For example chocolate, cherries and nougat. Yes, that’s right. 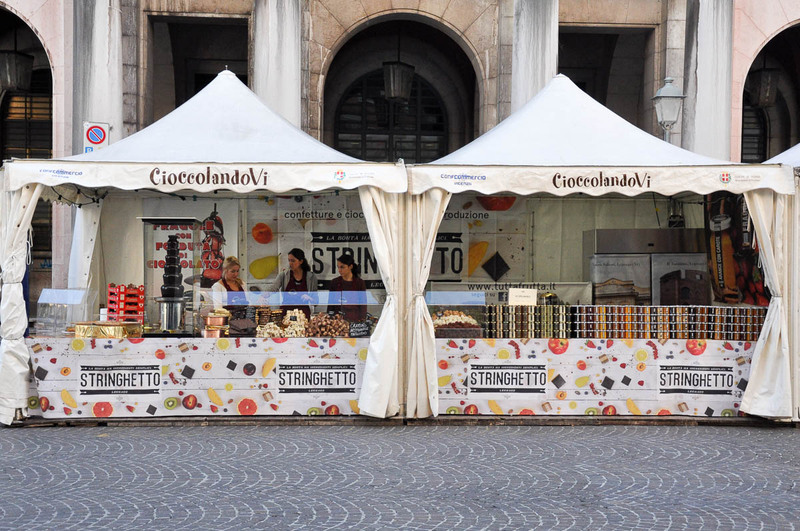 There are chocolate markets in Italy. They take place over a weekend and can have dozens and dozens of traders selling dozens and dozens of different types of chocolate. Same with nougat. Nougat is traditionally eaten during the Christmas period in Italy and some of the best nougat in the country comes from Cremona and Cologna Veneta. Hence, both towns have a nougat fair each in the run-up to Christmas. 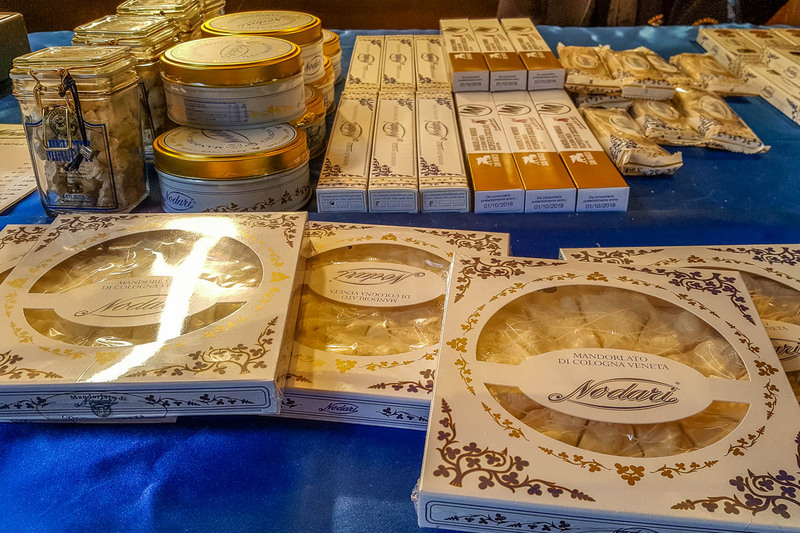 Nougat in Cremona is called torrone and in Cologna Veneta – mandorlato veneto. The differences don’t stop with the name, so make sure that you try a piece of nougat from both places. As for the cherry markets… You can see one for yourself in Marostica – a pretty medieval walled town in the Northern Italian region of the Veneto. Marostica is famous for its cherries. They are large, juicy and very tasty. The town celebrates the Marosticana cherry each spring with a multi-day event. 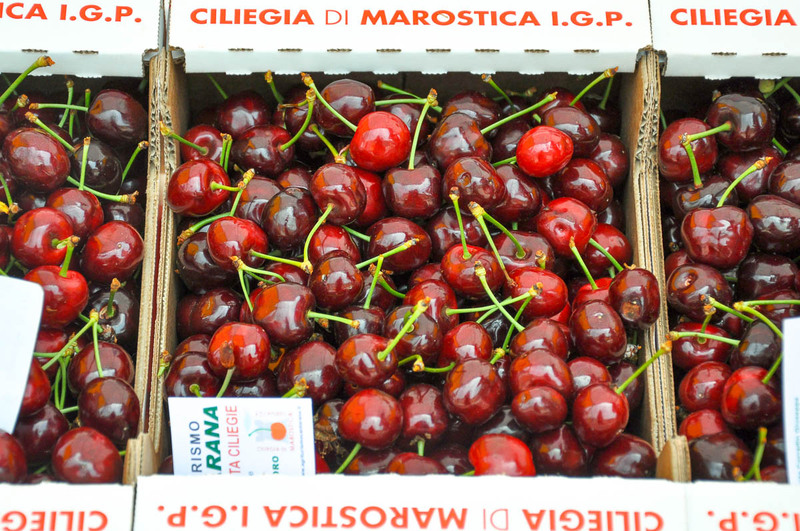 Marostica’s central square is taken over by the stalls of the local cherry producers who sell just this – cherries. It’s a great place to visit! So, when you visit Italy, make sure that you find out what the city or the town you will be at is famous for in terms of food. Then, ask if there will be a special market or a fair dedicated to this foodstuff while you are there. If you have timed your visit correctly, you will be in for a real treat. 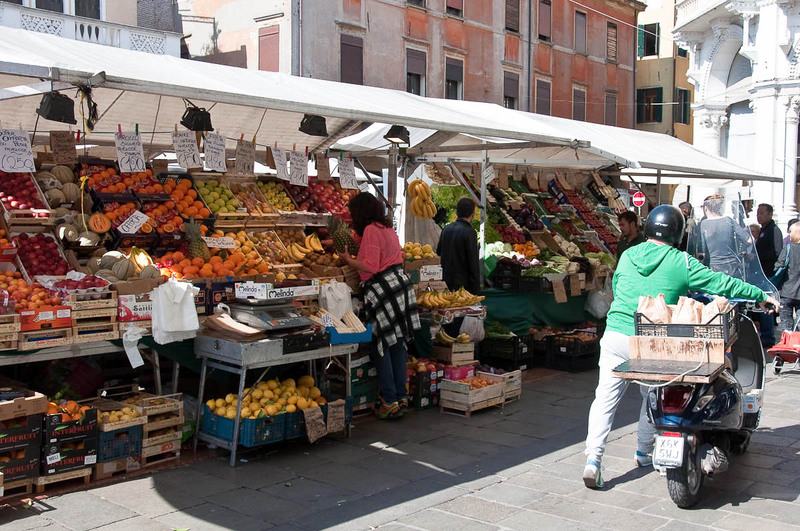 Markets in Italy are great vibrant places where you can feel the heartbeat of the country while picking some fresh fruit and veg or a century-old antique. 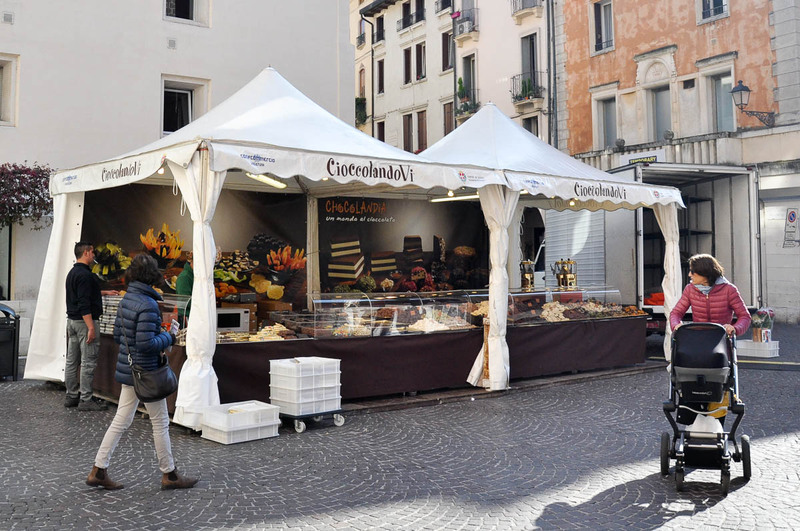 There are several types of markets held regularly all over Italy. 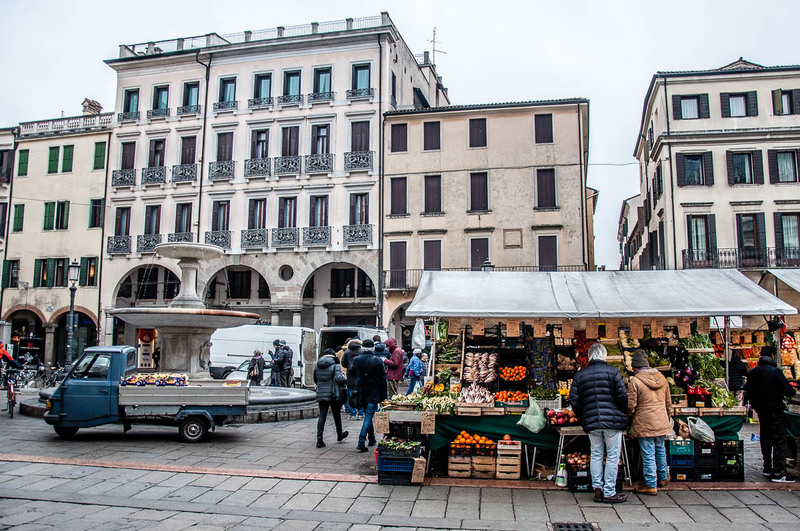 From fresh produce to handmade crafts, from just-caught fish to potted plants, from curtains to chocolate, expect to find anything and everything sold from a market stall or a market van in Italy. Don’t miss any chance you are presented with to spend some time at a market in Italy. It may end up being one of your most favourite memories from your trip to this beautiful and exciting country. Do you like shopping at markets? 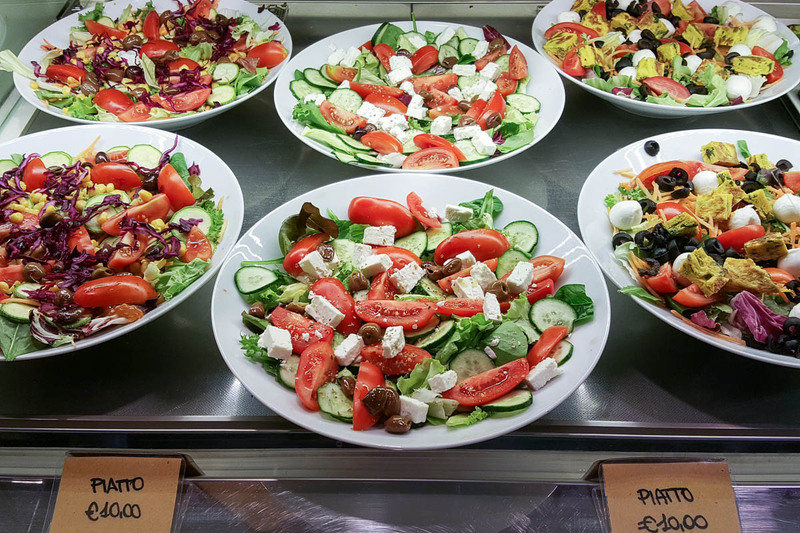 Which is your favourite market in Italy or anywhere in the world? What do you like buying at markets as opposed to shops? Let me know below!